Photographed at Big Spring State Park. 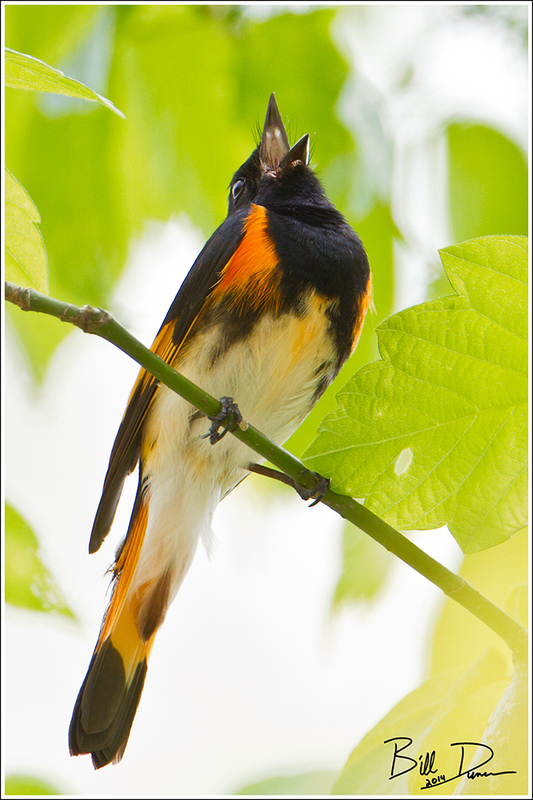 The American Redstart song seems to be more variable than any of the guidebooks suggest. It is late summer/early autumn and the warblers and other songbirds are moving en masse south to their tropical wintering grounds. Bring your binoculars to one of several wooded lots in the St. Louis metropolitan area this time of year and you’re almost sure to find one of the birds pictured here, the American Redstart. I am calling this particular bird a mature female, although it is possible this may be an immature female or first year male. Females and young males have yellow where adult males are always dressed for Halloween in reddish orange and dark browns. This observation has prompted many a birder to call these guys the “American Yellowstart” . 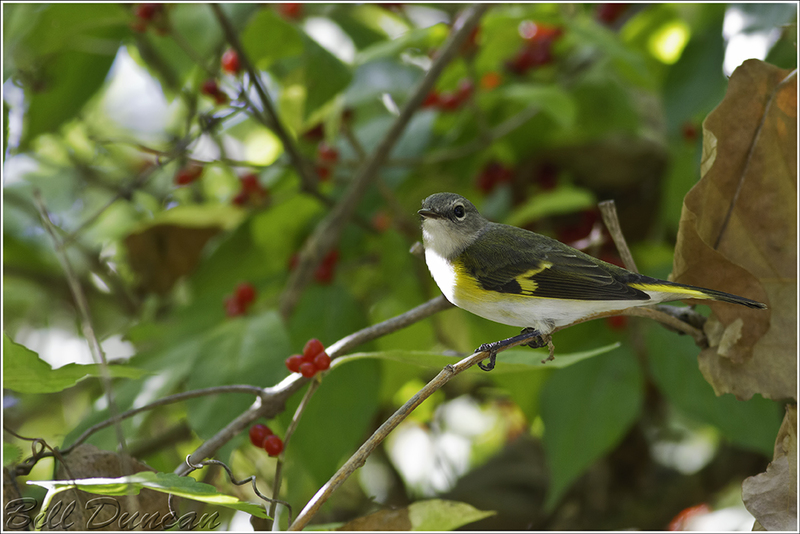 This is one of the easiest warblers for new birders to identify, not only for its flashy coloration and pattern but for its particular behaviors as well. These guys will usually position their wings low and drooped when sitting still and almost always are fanning their flashy tail feathers. These birds are quite active and display a lot of “flycatching” behavior and will actually hover-preen. Watching them hunt is a treat and as they catch flying insects you can literally hear these little guys snapping their beaks shut. They can be quite responsive to pishing. As mentioned above, this bird is heading south where it will over winter somewhere between northern Mexico and northern South America. It has an extremely large breeding range, nesting anywhere between the gulf states and Alaska where it can find deciduous or mixed deciduous/coniferous forests. These guys will also readily nest in secondary woodlands and forests, making them one of the few species who has not been altogether troubled by logging. I wish this guy the best in her/his long journey south. I am getting quite addicted to shooting these guys just when they are heading out. I’m already looking forward to the spring.